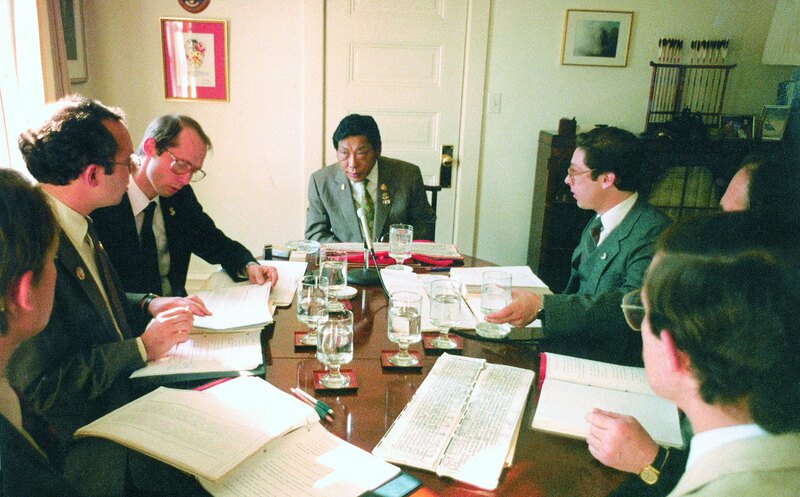 Vidyadhara Chogyam Trungpa Rinpoche meeting with the Translation Committee at the Kalapa Court in Boulder (1985). Photo by Liza Matthews. 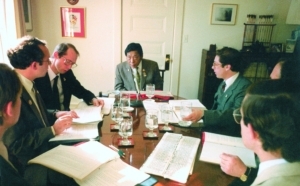 Sakyong Mipham Rinpoche meeting with Surmang Khenpo and the Translation Committee at the Kalapa Court in Halifax. Photo by Marvin Moore. Notes that introduce each chant and explain various terms (names, mantras, and so on) have been available previously in the Vajradhatu Practice Manual. They can now be found on our website here. This fall we’re delighted to publish a new edition of the Daily Chant Book. It will contain all the previous chants as well as nine additional liturgies that Sakyong Mipham Rinpoche has selected as options for the enrichment of our practice. The Daily Chant Book is a collection of liturgies, known as a chöchö (Tib: chos spyod, “dharma practice”), and traditional compilations of this type can exceed a hundred pages. Of course not all of these are used on a daily basis. The term chöchö also refers to the ten spiritual activities,including making offerings, understanding the teachings, reading the teachings, and reciting scriptures. Chanting in the morning and evening helps to provide an experience of twenty-four-hour practice. The events of the day and night are sandwiched between periods of practice. In the morning, the chants provide the first spark of connection to the lineage, the teachings, and to our discipline. In the evening, they help to sum up and recall the entire day in the context of dharmic activity. Chanting is a practice in itself. Ideally we can cultivate an awareness where the words and the sense come together as an expression of realization. Chanting is a proclamation of the teachings. Hearing, contemplating, and meditating occur naturally. The time of day and order in which certain chants and practices are done depends many factors. The natural hierarchy of the three roots—guru, yidam, protector—is a main organizing principle. The order of protector chants is also based on a traditional ordering of dharmapalas (transcendent) and then lokapalas (worldly). The Vidyadhara and Lama Ugyen clarified the order for all the chants and practices. The Daily Chant Book developed in a piecemeal fashion. The “Supplication to the Takpo Kagyü,” “Vetali,” and the “Heart Sutra” were the earliest components to be used widely. The Kagyü lineage chant was definitely in use by 1971, which is also the year the Vidyadhara wrote “Vetali” in English. Francesca Fremantle translated the “Heart Sutra,” and it was published in Garuda III in 1973. Other protector chants were composed by the Vidyadhara in Tibetan during the mid-‘70s: Ekajati for Tail of the Tiger (aka Karme- Chöling), Vajrasadhu for Karma Dzong in Boulder, Four-Armed Mahakala for the Dharmadhatus (Shambhala Centers), and Magyal Pomra for RMDC (Shambhala Mountain Center). Throughout the 1970s, all these existed as simple typescript photocopies. The “Supplication to the Takpo Kagyü” served as the focus of the only Tibetan-language class we know of the Vidyadhara teaching (1974), and most of the students became charter members of the Nalanda Translation Committee. Although its translation was already well-known to us, it particularly inspired our quest to study Tibetan, since doing so enriched our understanding of dharma. After the first few years of helping the Vidyadhara with translations, we wanted to review the existing daily chants, most of which had been translated by the Vidyadhara before the Translation Committee came into existence. We had questions about the meaning of certain phrases or terms, and it had become clear that we needed more standardization. More than anything, it was a chance to learn about the meaning of the dharma we were reciting. It enlivened our practice by demystifying what the lineage was transmitting to us, through helping the words and the meaning emerge simultaneously. While it was a delightful learning experience to read these texts with our guru, it was also a very difficult process to reshape the language of chants that we had all memorized through repeated use. Relearning these would become an irritant for many, including us. While we sought to correct previous mistakes, we often left the existing unaltered when either the meaning was close enough or grammatical considerations became secondary to leaving the liturgy in the form that thousands of practitioners had memorized. 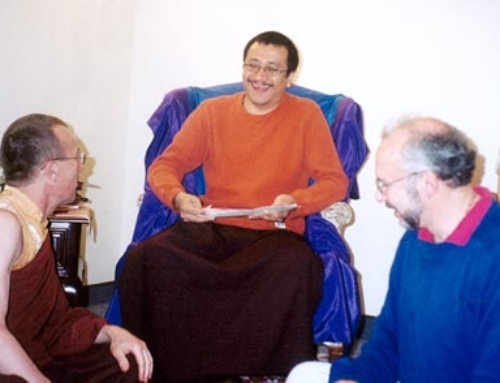 The three-month Vajradhatu Seminary became our most treasured laboratory and translation factory, beginning in 1976 with the arrival of Lama Ugyen Shenpen, an attendant and secretary of Dilgo Khyentse Rinpoche. During that early period, the Dorje Loppön Lodrö Dorje, head of the Office of Three Yana Studies, and Sherab Chödzin, editor-in-chief of Vajradhatu Publications, were the first coordinators of the Translation Committee’s activities—and so we benefited from their intellectual expertise and editorial acumen. It was during the 1979 Seminary that we began revising the daily chants—reviewing the Tibetan originals with the Vidyadhara for the first time. Since the Vajradhatu Seminary was where we worked most closely with the Vidyadhara, it was also where new chants were usually introduced. Because this was an international gathering of students, it was one of the rare occasions when we practiced all of the protector chants and related liturgies each evening. Reviewing the daily chants continued at the 1980 Seminary, and sometime after that we issued our first and only revision of the existing daily liturgies used in our community. We believe this was the first time that the Daily Chant Book was published in its current format. The present design was created in the late ’70s by Julie Runk, then the main designer at Shambhala Publications. Julie based her design in part on the size of a Tibetan text when used for practicing, by opening the long horizontal pages of a Tibetan pecha to a two-page spread (top to bottom). Since we turn our pages from right to left, the Vidyadhara preferred to emulate our Western-book style rather than imitating a Tibetan pecha. Two side-by-side, almost-square pages fill the same area as an opened Tibetan pecha—a design that fits well with having one’s practice implements just in front of the text, as is the custom with vajrayana sadhanas. Over the years, new chants have continued to be added such as a new protector chant for a particular center, sometimes for occasional use. Some chants were restricted to tantrikas, others for advanced stages of the Shambhala teachings. 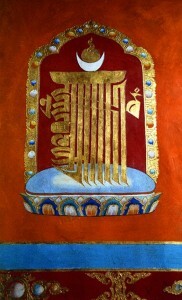 The Earlier Translation Old School (Ngagyur Nyingma) developed as the dharma was first brought from India to Tibet, beginning in the 7th century, and the Later Translation New Schools (Chigyur Sarma) are generally considered to have begun with the great translator Rinchen Sangpo (958-1055). We seemed to be creating a “retranslation school” in our efforts to refine and improve our work—a process that continues to this day. We try to keep the long view in mind—concerned about the accuracy of our work for future generations. Over the years we have discovered mistakes, and no doubt more will come to light. Sometimes the Vidyadhara himself noticed these, such as when he heard the “Heart Sutra” being chanted in the shrineroom above his office one day. He mentioned to his kusung: “We have to remember to fix the name of the samadhi. It’s backwards. It should be something like ‘illuminating the profound.’” It took some years before we heard this story, and we are still researching this to decide what would be the best translation, as both the Sanskrit and Tibetan are ambiguous. The “Supplication to the Takpo Kagyü” is another chant we intend to revise at some point, both to eliminate any gender-biased language and to correct a few subtle errors in meaning. It is our custom not to introduce revisions to a liturgy until we have completely finished our research, which often takes quite a long time. The new edition of our Daily Chant Book will contain revisions to the following chants: “The Sutra of the Recollection of the Noble Three Jewels,” “Exorcism Chant,” and “Concluding Request to the Protectors.” Probably only the last of these will be immediately obvious. We changed “lordship” on the fourth line to “power,” which is a more literal rendering and avoids the gender bias. A few other chants contain very minor spelling or punctuation modifications. All changes will be summarized in the Errata and Addenda section of the Publications pages on our website. We discussed all our concerns with the Sakyong several years ago. He too felt strongly that it was important to correct any mistakes we can, especially for the sake of future generations, but he was also very sensitive about not wanting to disturb well-established conventions. We worked hard together to fashion the most acceptable readings with a minimum of changes. In consultation with Sakyong Mipham Rinpoche, the following chants will be added to our Daily Chant Book, most as options for our practice. With this supplication, composed by Jamgön Mipham Gyatso (1846 – 1910), we call upon the infinite hosts of magnetizing deities of the padma family. We ask these wisdom beings of the three kayas and three roots to bestow their blessings and grant us the supreme and ordinary siddhis—primordial awareness and relative worldly accomplishments—as well as the siddhi that unobstructedly magnetizes whatever we desire. This was composed by Jamgön Mipham Gyatso in 1896, based on a sutra of Shakyamuni Buddha. It may be recited at any time, though Sakyong Mipham Rinpoche has particularly encouraged us to chant it at the start of a new undertaking, as is traditional. These verses of auspiciousness invoke the power of goodness in the form of eight buddhas, eight male bodhisattvas, eight female bodhisattvas (manifesting as offering goddesses), and eight protectors so that any obstacle may be overcome and our projects and endeavors, both dharmic and secular, may meet with success. This liturgy is a collection of verses to Nyingma lineage holders compiled from a variety of authors. This particular compilation is used at Namdroling Monastery in South India, usually chanted by khenpos before presenting teachings at the shedra. 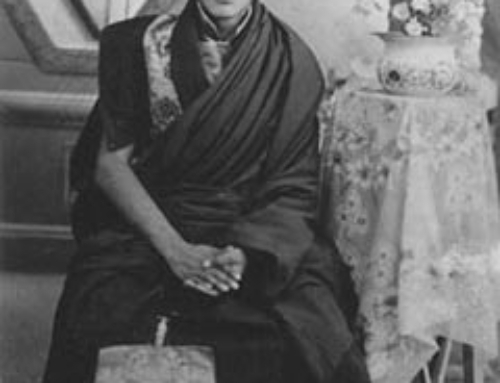 It was introduced to the sangha at the first Mipham Academy at Karme Chöling. This guru supplication, composed by Dilgo Khyentse Rinpoche after the parinirvana of the Vidyadhara in 1987, at the request of Lady Könchok Paldrön, is not a rebirth supplication. Rather, it supplicates the guru, whose wisdom, compassion, and power are always present for the student. Written by the Vidyadhara in Tibet and originally translated for use in the feast offering for his Avalokiteshvara terma. This is a brief torma offering to the three main protectors of the Longchen Nyingtik (Heart Essence of the Great Expanse) of the Nyingma lineage. To highlight the importance of the home as a place of practice and realization, Sakyong Mipham Rinpoche composed this chant, which invokes all the protectors of Shambhala. This supplication for the Sakyong’s longevity was composed in 2007 by Namkha Drimed Rinpoche at the request of the Sakyong Wangmo, and it was introduced to the sangha that summer. Composed by Jamgön Mipham Gyatso in 1888, this is a general supplication for the longevity of all teachers. This aspiration poetically chronicles the history and development of the dharma from India to its establishment through the Nyingma lineage in Tibet, the main vehicle for the ati teachings. It focuses specifically on the teachings of the Nyingma, which its author, Jamgön Mipham Gyatso, invigorated through his prolific teaching and writings. Some of our revisions may go unnoticed by most people. For example, in the “Invocation for Raising Windhorse” we plan to hyphenate the Kalachakra mantra: OM HA-KSHA-MA-LA-VA-RA-YAM. We hope that this will encourage people to pronounce this as if it were two words: OM and HAKSHAMALAVARAYAM, rather than sounding each of the syllables separately as many do. These very special seed syllables are often written as a monogram, known as the “all-powerful ten,” and they are meant to be read as a unit, the ten components being H-K-SH-M-L-V-R-Y-M and the A vowel.